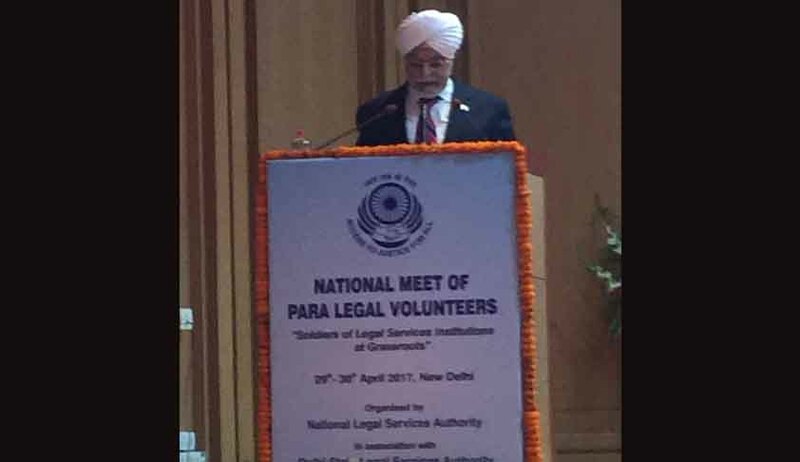 Inaugurating two-day National Meet of Para Legal Volunteers at New Delhi, Chief Justice of India J S Khehar said service to poor is super divine duty which the volunteers are doing than the divine duty discharged by the judges. Justice Khehar has called for assessment of their work at village level so that the legal services authority can guide the volunteers towards effective justice. In the light of revised Para Legal Volunteers 2013, CJI said the marginalised people living in distant places do not get the benefit of lawyers and para legal volunteers provide them the legal assistance. "The last mile connectivity for a villager under the scheme is not the lawyer but the para legal volunteers working under the legal services authority”. “It is the volunteers who impart to the villagers the awareness of laws and legal system....I feel that time has come to put the scheme on a firmer basis by requiring each volunteer to file a work plan and schedule and keep a diary provided by the legal services authority for each day's work. The diary may be checked on regular basis so that authority can mentor, advise and guide the volunteers towards effective justice" Justice Khehar said. Union Law Minister, who was present at the function, emphasised for digitally delivery system for quick access to justice for marginalised section of society. He said the National Legal Services Authority (NALSA), the organiser of the meet, has two Lakh Common Service Centre (CSC) and the volunteers can approach for providing services to poor.